This Ben Nevis is part of the 24 x 20cl bottles that make up the Carn Mor Vintage Collection. Distilled in 1997 and bottled in 2009, it’s from a limited edition of 1275, Cask No: 252. Non-chill filtered, no added colour and 46%, so the makings of something very delightful! 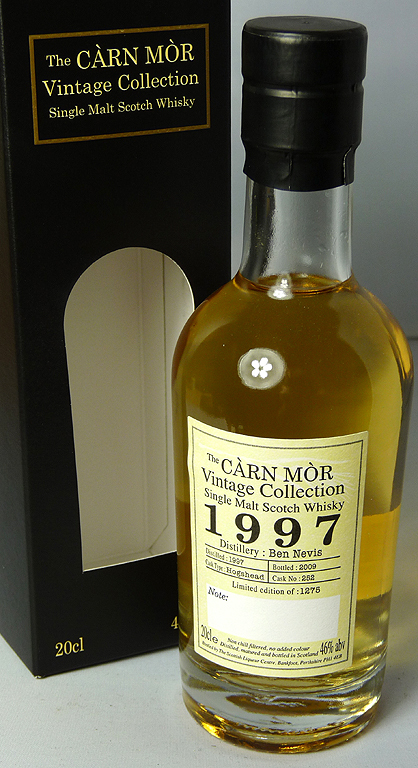 Although reviews for the 20cl Carn Mor collection are hard to find, I did stumble across this assessment of the Ben Nevis on Whiskyconnosr by markjedi1, a keen whisky drinker from Belgium with over 1000 reviews. He scores it 79/100, with comments that sound very reasonable. He also has his own blog in Flemish, which proved to me that I don’t understand a word of Flemish! No surprise there. But he also has his own whisky website in English The Toshan Man which I’m delighted to give a plug to. This entry was posted in Ben Nevis and tagged 1997, 20cl, 46%, Ben Nevis, Carn Mor, Highlands, NAS, Single Malt, Single Malts Direct. Bookmark the permalink.